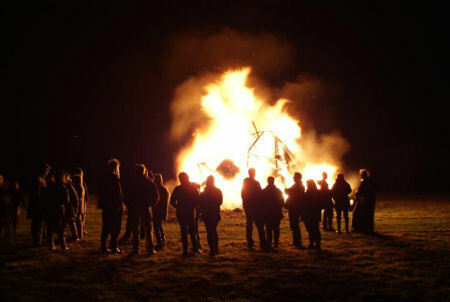 Tuesday is Bonfire Night! Guy Fawkes night for some, though I can’t remember ever, as a kid, knowing what bonfire night represented except a good time! I don’t think the tradition is as strong as it once was. When I was a teen, we’d have been cutting trees for months, I remember one year starting in August! We’d gather them, and anything else we could burn, boats, driftwood, garbage, pretty much anything. Come supper time on the 5th, we’d light it up, keeping much off to one side to keep it going all night. Many times we’d have enough fuel to restart it from its coals the next night and do it all again. Old tires had to be a favorite to burn for sure, they’d burn and pop, and stink everything up, and turn us all black with soot, but we had a ball. Off to one side we’d have smaller camp fires to roast potatoes, wieners, marshmallows, and maybe some less traditional roasting foods, like kippers! I remember many if not most of our fires were on the beach. I remember one year in particular it being down on McGrath’s Cove below Colin Miller’s house, and us getting up on the bank to watch. I think i remember Rick throwing a bag full of aerosol cans in that one, for our own form of fireworks. The beach was covered in shaving cream! As we grew up, most of us stopped the smaller community fires and many of us would gather and help at the one on Randall’s garden in Snook’s Harbour. I remember the huge piles of brush and tires. It was also fun to look up and down the sound in the night and see the fires in Georges Brook, Harcourt and Monroe. I think though the best memory has to be the time there was an empty propane tank on the fire, and Gar Whelan risked life and limb to run into the fire and yank it out before it exploded! Many “beverages” were consumed, and often the police were there too, though they never interfered, or stopped us from having our “beverages” in public. I do think they got too close one year and the paint on the door melted a bit! Though perhaps that was someone else’s car, memories run together as you get old. The link below is to a video on Memorial University’s site. Have a watch, and feel the memories flood back. Hope you all have a great bonfire night!